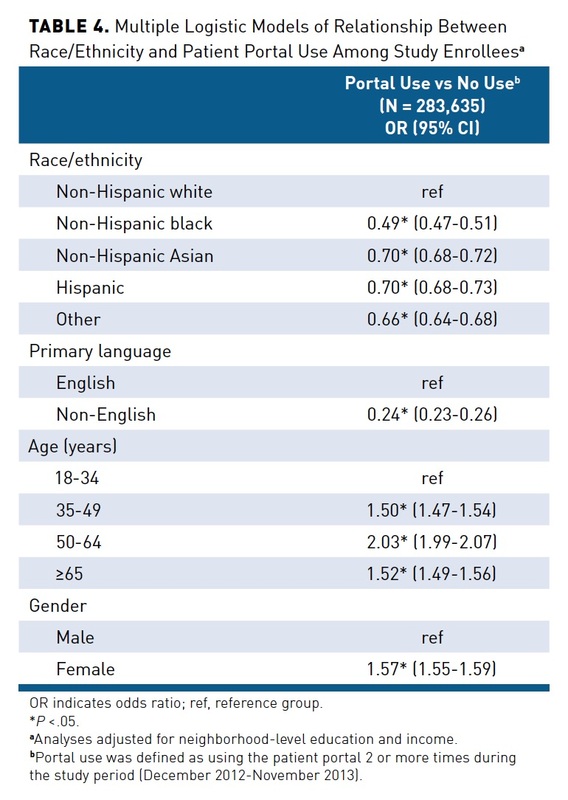 Portal enrollment and use are generally lower among racial/ethnic minority patient populations.7,10,12,15,16 Specifically, black, Hispanic, and Asian patients have been found to have lower enrollment and use of patient portals than non-Hispanic white patients, even after adjusting for internet access and use.7,9,10,12,15-17 However, new technologies, such as smartphones and other mobile devices, may help attenuate differences in patient portal use among racial/ethnic minority patients. Mobile device browsers can be used to access patient portal websites, and healthcare organizations are implementing mobile applications with similar sets of services.18 Blacks and English-speaking Hispanics are more likely to own a smartphone and use a wider range of its applications (eg, internet, email) than whites.19 Compared with whites, blacks and English-speaking Hispanics also are more likely to rely on their smartphones for access to the internet.19,20 Although racial/ethnic minorities are more likely to own and rely on mobile devices, the current extent of access to patient portals with mobile devices is unknown. We examined the relationship of race/ethnicity to patient portal use and devices used to access the portal among enrollees in an integrated healthcare delivery system. We focused on patient portal functions associated with the Meaningful Use criteria, specifically measuring patient healthcare management tasks that engage the healthcare provider and healthcare system. Similar to previous findings, we hypothesized that non-Hispanic whites would be more likely to use the patient portal than racial/ethnic minority enrollees. Given the high rates of smartphone use among racial/ethnic minorities, we further hypothesized that black and Hispanic enrollees would have a higher proportion of patient portal use via mobile devices (compared with desktop/laptop computers) than non-Hispanic white enrollees. This study was conducted in Group Health Cooperative (now Kaiser Permanente Washington), a mixed-model healthcare delivery system in Washington state. Approximately 400,000 members receive their care through Group Health’s integrated delivery system, which includes 25 Group Health-owned facilities and approximately 1000 Group Health physicians. The online patient portal has been available on the patient website (ghc.org during the time of the study, currently kp.org) since 2003 and on a mobile application (for both iPhone and Android) since 2011. Enrollees are informed of the website and portal functions upon enrollment. Mobile application use is encouraged via several marketing methods, including the patient website and screensavers throughout clinics. To access the patient portal, patients register online on the patient website (through a desktop/laptop or mobile Web browser) and verify their identity at a clinic or register in person at any clinic.3 Once registered, patients can access a number of features, including portal functions. Access is available to all patients in the integrated delivery system and is available only in English. This cross-sectional study drew from 5 enrollee data sources: administrative data for individual demographic information, Web server logs to identify devices used to access functions, EHR records to identify functions accessed, online prescription refill data to identify medication refill requests, and 2010 US Census data for Census block-level demographic information. The Group Health Research Institute’s Institutional Review Board approved this study. Our primary outcomes of interest were 1) portal use among study enrollees and 2) devices used to access the patient portal among portal users. We defined portal use as having used any of 8 eligible portal functions that directly engaged patients with the EHR on at least 2 days within the study period. The 8 portal functions align with federal Meaningful Use requirements: secure messaging with providers, requesting medication refills and appointments, and viewing after-visit summaries, medical test results, medical conditions, allergies, and immunizations.3,21 We defined portal use as 2 uses on 2 days to identify meaningful engagement with the EHR (rather than a single log-on) and to allow for multiple devices to be used for accessing functions. Devices used to access the patient portal were identified through server logs.22 We parsed HTTP request strings from Web server log data to identify specific devices (eg, smartphones, tablets, desktops/laptops) and mode of accessing the data (eg, Web browser, mobile application). Log data were matched with EHR records within a time window. All 8 portal functions were accessible through all devices and modes of access. We categorized devices used as desktop computer only, mobile devices only, and both device types. “Desktop computer only” captured both desktop and laptop computer use; our methodology could not distinguish between these devices and the similar user interface (eg, a physical keyboard) of laptop and desktop computers warranted their combination. “Mobile devices only” indicated use of smartphones and tablets to access the portal through the mobile application or Web browser. “Both device types” indicated use of desktop/laptop computers and mobile devices. Our independent variables were race/ethnicity, age, gender, primary language, and neighborhood-level education and income. We obtained race/ethnicity, gender, age (18-34, 35-49, 50-64, or ≥65 years), and primary language (English or any other language) from administrative data. These variables were collected mostly by administrative staff at enrollee registration in the plan. Self-reported race/ethnicity was our primary independent variable and was categorized as Hispanic, non-Hispanic white, non-Hispanic black, non-Hispanic Asian, and non-Hispanic other. “Other” included enrollees who self-identified as Native American, Hawaiian/Pacific Islander, or with 2 or more races. For bivariate analyses, we examined descriptive characteristics by race/ethnicity using χ2 tests and examined pairwise comparisons for device use and portal use by race/ethnicity (compared with white) using 2-sample tests of proportions. We used multiple logistic regression to determine independent associations between race/ethnicity and portal use among all study enrollees. We used multinomial logistic regression to determine the relationship between race/ethnicity and devices used to access the patient portal among portal users. We report these findings as relative risk ratios; values greater than 1 suggest greater relative risk than the reference group, whereas values less than 1 suggest lower relative risk. Sensitivity analyses including the “missing” race/ethnicity and primary language category from regression models were conducted to assess the impact of missing information on results. We present descriptive information for enrollees missing race/ethnicity and primary language, but excluded these categories from the regression models because results with these categories were similar in significance and direction. All analyses were conducted using Stata version 13.0 (StataCorp LLC; College Station, Texas). 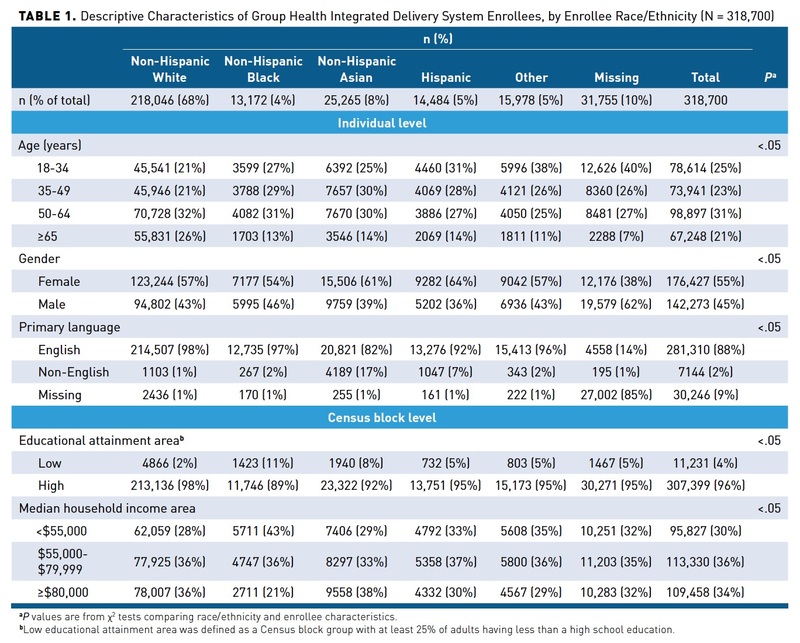 Among 318,700 Group Health enrollees, 68% were white; 4%, black; 8%, Asian; and 5%, Hispanic (Table 1). Enrollees varied significantly across demographic characteristics. Twenty-six percent of white enrollees were 65 years or older compared with 11% to 14% of racial/ethnic minority enrollees. Asians and Hispanics had significantly higher proportions of enrollees with a primary language other than English (17% and 7%, respectively). Blacks had the lowest proportion living in high educational attainment areas (89%) and the highest proportion in the lowest median household income areas (43%). Mean months of enrollment during the study period did not vary by race/ethnicity (data not shown). Race/ethnicity and primary language were missing for 10% and 9%, respectively, of study enrollees. Race/ethnicity data also were most likely to be missing among younger male enrollees. Among the study sample, 74% registered for the patient portal and 56% used the portal during the study period (Table 2). Portal registration and use was highest among white enrollees (81% and 64%, respectively) and lowest among black enrollees (64% and 44%). The majority of portal users accessed the following: medical test results (87%), secure messaging (68%), and medication refill requests (54%). Compared with whites, racial/ethnic minority users were less likely to use secure messaging and submit refill requests, but similarly or more likely to view medical conditions, immunizations, and allergies. Compared with enrollees whose primary language was English, enrollees with another primary language were significantly less likely to use the patient portal. These portal users were less likely to use secure messaging, request appointments and medication refills, and view after-visit summaries (eAppendix [available at ajmc.com]). The devices used to access the portal varied by race/ethnicity (Table 3). Sixty-two percent used desktop computers only, 6% used mobile devices only, and 32% used both device types. 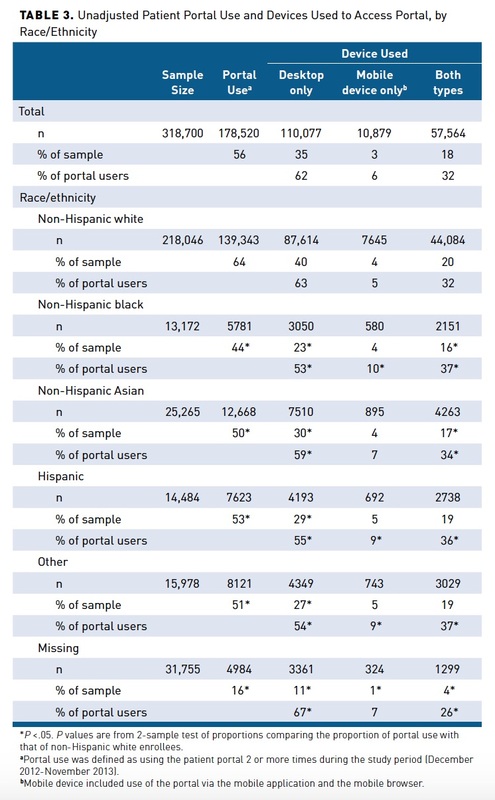 White portal users had the highest proportion using only desktop computers (63%), whereas Black and Hispanic portal users had a higher proportion using only mobile devices (10% and 9%, respectively) compared with lower mobile-only use among white portal users (5%). Using both device types to access the portal was higher among all racial/ethnic minority portal users. 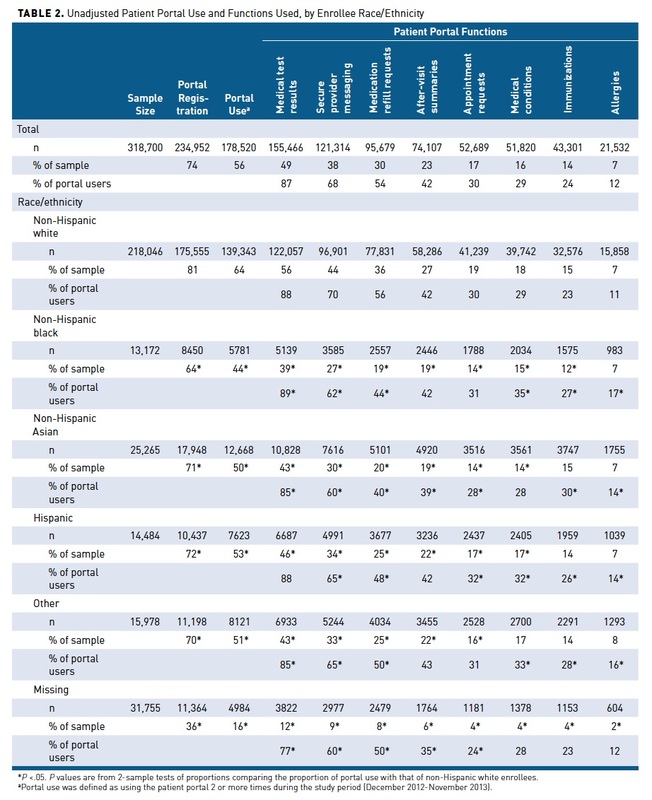 After adjustment for age, gender, primary language, neighborhood-level education, and neighborhood-level income, differences in portal use remained significant for all racial/ethnic minority enrollees compared with white enrollees (Table 4). Black, Asian, and Hispanic enrollees had significantly lower odds of portal use than white enrollees (odds ratios [ORs]: 0.49, 0.70, and 0.70, respectively). Additionally, enrollees whose primary language was not English had significantly lower odds of portal use than those whose primary language was English (OR, 0.24). Device used to access the patient portal varied among all portal users (Table 5). In the unadjusted model, all racial/ethnic minority portal users were significantly more likely to use mobile devices and both device types than desktops only compared with white portal users. 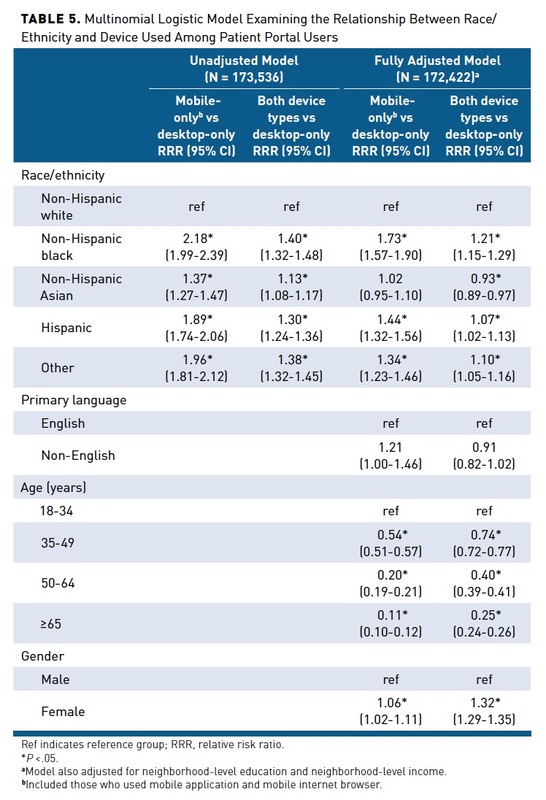 After adjustment, compared with white portal users, black and Hispanic portal users were more likely to use mobile devices only than desktops only to access the portal (relative risk ratio [RRR], 1.73 and 1.44, respectively; both P <.05) and more likely to use both device types (RRR, 1.21 and 1.07; both P <.05). After adjustment, Asian portal users were less likely to use both device types than desktops only (RRR, 0.93; P <.05) compared with whites. Asian portal users also were no longer significantly different from white users in their use of mobile devices only. Primary language was not significantly associated with device used. We observed important racial and ethnic variations in use of the online patient portal and in the proportion of devices enrollees used to access the portal in an integrated healthcare system. Although most patient portal users continued to use solely desktop or laptop computers to access the portal, 10% of black and 9% of Hispanic enrollees used mobile devices exclusively to access their patient portals during the study year. Black and Hispanic portal users were more likely than white portal users to use mobile devices only or both device types to access their portals. Although overall portal use was high among all enrollees, racial/ethnic minority enrollees remained less likely to use the portal compared with white enrollees. Almost two-thirds of white enrollees used the portal, yet approximately half or less of racial/ethnic minority enrollees used the portal. There are several important limitations to note. First, we were unable to determine many enrollee characteristics, such as literacy (including reading/writing, computer, and health), internet accessibility, mobile device use preferences (eg, accessing the internet and potentially sensitive information), and individual socioeconomic factors. Although we were unable to control for internet accessibility, particularly mobile device ownership, previous studies measuring any internet use found racial/ethnic disparities to persist in portal use.15,16 Third, we observed higher levels of missing information for language and race/ethnicity; however, these data were self-reported in Group Health datasets according to organizational standards. Prior studies have also reported high rates of missing information among these variables.7,16 Notably, Meaningful Use Stage 1 requires healthcare organizations to have these fields populated for more than 50% of patients, as both fields need to be better populated to measure possible enrollee disparities.29 Fourth, we measured portal use as using eligible portal functions on at least 2 days. This may have biased the portal user sample toward patients with chronic medical conditions and away from younger, healthier patients who seldom use healthcare services. However, we believe this measure better captures meaningful engagement in care compared with other metrics of website use and allows all categories of devices used (ie, both device types) to be endorsed equally. Fifth, most Web server log entries did not have identifiers to link enrollees to devices, and we matched patient portal records to identifiable log entries using the function’s timestamp; we validated this approach through use and data capture in the EHR and portal test environment.22 Although this approach may have resulted in some underestimation of overall portal use, we do not believe this method caused any systematic bias by race/ethnicity. Finally, Group Health is an integrated delivery system and its racial/ethnic composition differs from that of the general population; these findings may not be generalizable to other healthcare systems. However, this study more accurately captures devices used to access the portal by collecting electronic data, rather than relying on self-reported use data; this removes the information bias that is a common concern in patient behavior studies. Mobile devices are playing a large role in healthcare, from providing on-demand health information to helping patients and providers monitor and manage chronic conditions. However, researchers and healthcare organizations need to ensure that our increasing reliance on mobile technology does not exacerbate disparities in care and access among vulnerable populations.27 In addition to reconfirming racial/ethnic differences in online patient portal use, we found black and Hispanic portal users to be more likely to use mobile devices to access the patient portal. Mobile devices present an opportunity for healthcare organizations to increase their patient engagement among black and Hispanic enrollees. The accessibility and functionality of patient portals through mobile applications and mobile browsers may help reduce differences in patient portal use.